The political donations money laundering scams have left more very dirty hands in New South Wales. In fact, revelations reach the heart of Tony Abbott's Liberal/National coalition government. The latest to be exposed is the Speaker of Australia's House of Representatives, Bronwyn Bishop. Previously suppressed emails before a corruption inquiry raise serious concerns about a major donor to the Liberal Party being rewarded with extraordinary access to senior party figures. The emails are from the former chief fund-raiser of the NSW Liberal Party Paul Nicolaou to Peta Credlin, one of the most powerful figures in the federal government. 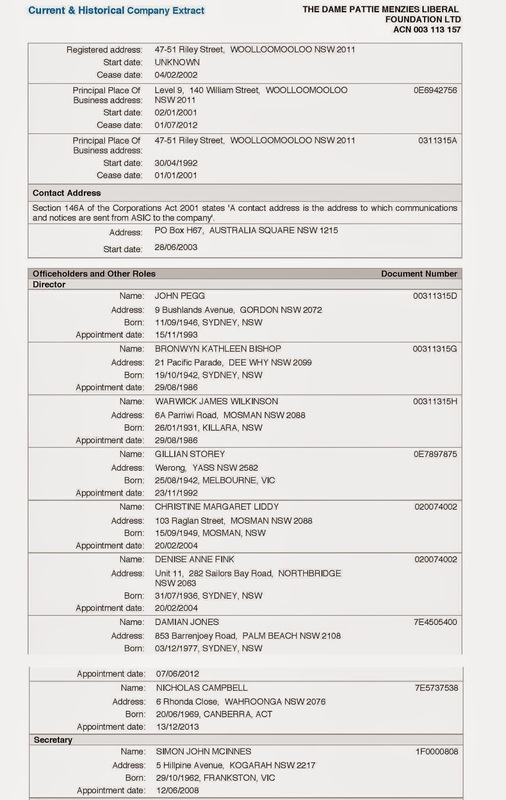 The emails reveal that, in March 2011, while the Coalition was in opposition, Ms Credlin used a major donor to the Liberal Party, Brickworks, as part of Tony Abbott's campaign against the carbon tax. ...Brickworks was one of the largest corporate donors to the Liberal Party, giving $384,000 in a nine-month period from July 2010 to April 2011. As well as its brand Austral Bricks, Brickworks also lists property development as a core business. The ICAC has heard that Brickworks used the Free Enterprise Foundation, a shadowy Canberra-based organisation, to channel $125,000 in illicit donations to the NSW Liberals for the March 2011 state election. 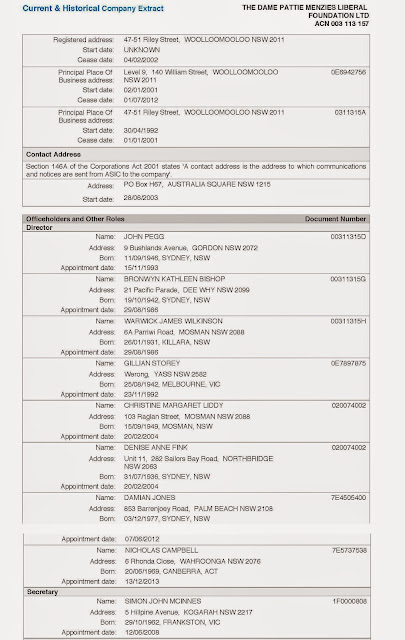 [Bronwyn Bishop] was a director of the Dame Pattie Menzies Foundation Trust, which received $11,000 from the Free Enterprise Foundation on December 9, 2010, which it then directed to the NSW branch of the party for use in the 2011 state election. In fact $27,000 was passed on to the NSW Liberals, including a $2000 donation to the Dame Pattie foundation (DPMLF) from Australian Corporate Holdings, a company connected to Sydney property developer Sydney Fischer. The tangled web spins even wider, as many of Dame Pattie Foundation's directors are key 'off-books' players, to use an ICAC phrase. In July 2010, Mr Nicolaou, who was getting a 6 per cent cut of all donations he collected, emailed Simon McInnes, the finance director of the NSW Liberal Party boasting: "Please note! Another $50k for us via Free Enterprise Foundation from Brickworks." Manildra, the only ethanol supplier in Australia which is set to make a motza from the mandate, has donated $1.2 million to NSW political parties over last 12 years, including $635,000 to Labor, $400,000 to the Liberal party and $132,000 to the Nationals. "Those three will operate and take responsibility for the financial affairs of the division, including fund-raising between now and the election – at least," Mr Baird said. "We must have confidence in our processes. It's something we must not shy away from. We have to be determined to shine the light on ourselves." Mr Pegg should start in his own backyard. Pegg is a former secretary of DPMLF so he should know about its operations. Anyway, back to the Speaker. Bronwyn Bishop is still listed as a director and should have resigned from this slush fund years ago. Her role as Speaker of the House of Reps should have caused her to review her directorships, especially of conduits (or should that be sewers) like this foundation. They exist for one reason only - to circumvent transparency concerning political donations and to hide breaches of the law. Pegg, McInnes and Campbell have all been called before ICAC. Maybe it's Bishop's turn. It seems the devil is in the detail of dodgy donations. Let's keep digging. What price good government? Thanks to @kate_mcclymont and a very special hat tip to Clarencegirl at North Coast Voices for her help and encouragement.